The train crash that occurred on Friday, July 5, 1912 was described in the Ligonier Echo as "A frightful and most terrible wreck. The worst ever known in the history of Westmoreland County railroading, happened about 3:30 p.m. on the Wilpen branch of the Ligonier Valley Railroad." 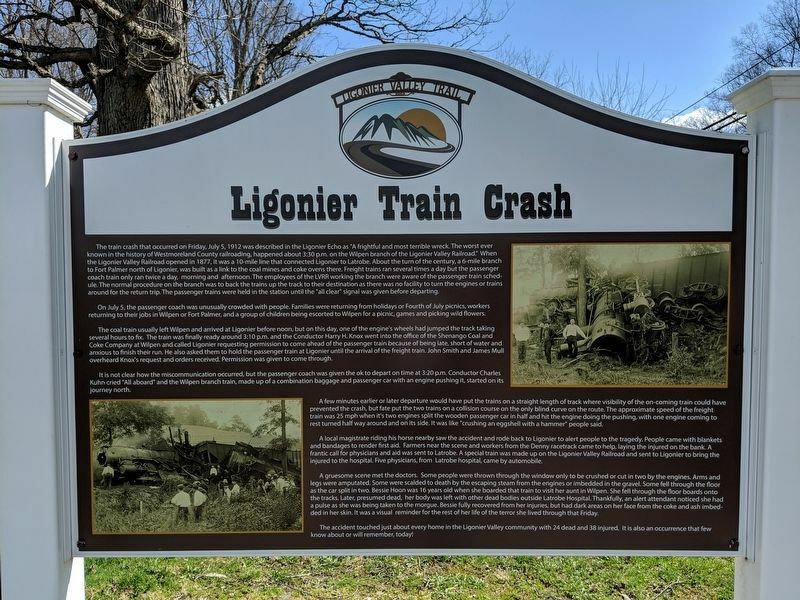 When the Ligonier Valley Railroad opened in 1877, it was a 10-mile line that connected Ligonier to Latrobe. 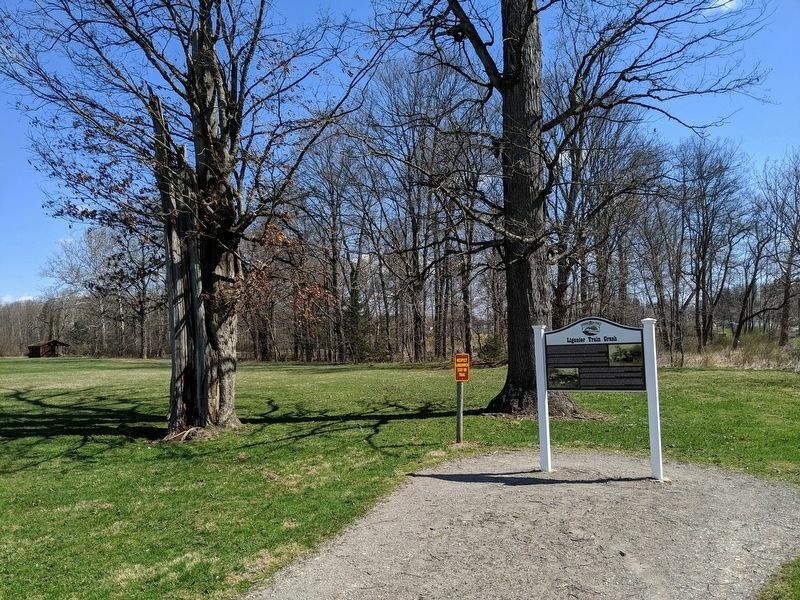 About the turn of the century, a 6-mile branch to Fort Palmer north of Ligonier, was built as a link to the coal mines and coke ovens there. Freight trains ran several times a day but the passenger coach train only ran twice a day, morning and afternoon. The employees of the LVRR working the branch were aware of the passenger train schedule. The normal procedure on the branch was to back the trains up the track to their destination as there was no facility to turn the engines or trains around for the return trip. The passenger trains were held in the station until the "all clear" signal was given before departing. to their jobs in Wilpen or Fort Palmer, and a group of children being escorted to Wilpen for a picnic, games and picking wild flowers. The coal train usually left Wilpen and arrived at Ligonier before noon, but on this day, one of the engine's wheels had jumped the track taking several hours to fix. The train was finally ready around 3:10 p.m. and the Conductor Harry H. Knox went into the office the Shenango Coal and Coke Company at Wilpen and called Ligonier requesting permission to come ahead of the passenger train because of being late, short of water and anxious to finish their run. He also asked them to hold the passenger train at Ligonier until the arrival of the freight train. John Smith and James Mull overheard Knox's request and orders received. Permission was given to come through. It is not clear how the miscommunication occurred, but the passenger train was given the ok to depart on time at 3:20 p.m. 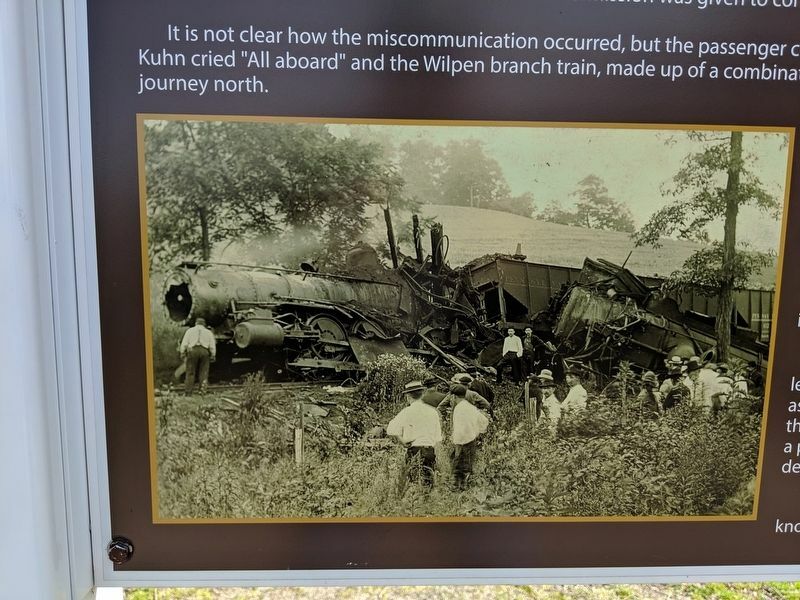 Conductor Charles Kuhn cried "All aboard" and the Wilpen branch train, made up of a combination baggage and passenger car with an engine pushing it, started on its journey north. 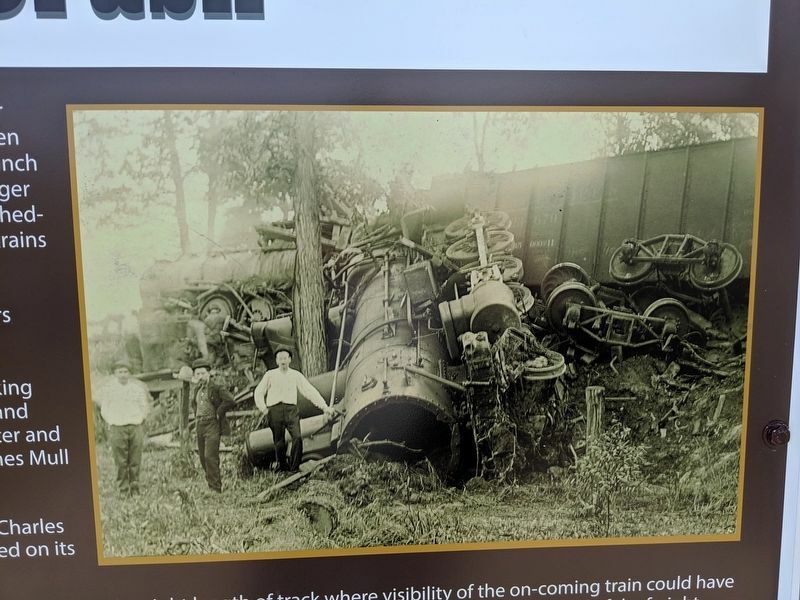 the freight train was 25 mph when its two engines split the wooden passenger car in half and hit the engine doing the pushing, with one engine coming to rest turned half way around and on its side. It was like "crushing an eggshell with a hammer" people said. A local magistrate riding his horse nearby saw the accident and rode back to Ligonier to alert people to the tragedy. People came with blankets and bandages to render first aid. Farmers near the scene and workers from the Denny racetrack came to help, laying the injured on the bank. A frantic call for physicians and aid was sent to Latrobe. A special train was made up on the Ligonier Valley Railroad and sent to Ligonier to bring the injured to the hospital. Five physicians, from Latrobe hospital, came by automobile. the morgue. Bessie fully recovered from her injuries, but had dark areas on her face from the coke and ash embedded in her skin. It was a visual reminder for the rest of her life of the terror she lived through that Friday. The accident touched just about every home in the Ligonier Valley community with 24 dead and 38 injured. It is also an occurrence that few know about or will remember, today! Location. 40° 15.309′ N, 79° 12.77′ W. Marker is in Ligonier, Pennsylvania, in Westmoreland County. Marker can be reached from Pennsylvania Route 711 0.2 miles east of Macartney Lane. Touch for map. Marker is in this post office area: Ligonier PA 15658, United States of America. Touch for directions. Other nearby markers. At least 8 other markers are within 2 miles of this marker, measured as the crow flies. Original Course of Forbes Road (approx. 1.3 miles away); Forbes Road (approx. 1½ miles away); Fort Ligonier (approx. 1½ miles away); Building the Highway (approx. 1½ miles away); Desert Storm Memorial (approx. 1.6 miles away); Ligonier Town Square Fountain (approx. 1.6 miles away); a different marker also named Fort Ligonier (approx. 1.6 miles away); Loyalhanning (approx. 1.6 miles away). Touch for a list and map of all markers in Ligonier. More. Search the internet for Ligonier Train Crash. Credits. This page was last revised on April 10, 2019. This page originally submitted on April 10, 2019, by Mike Wintermantel of Pittsburgh, Pennsylvania. This page has been viewed 37 times since then. Photos: 1, 2, 3, 4. submitted on April 10, 2019, by Mike Wintermantel of Pittsburgh, Pennsylvania.